Find out how campus emergency containers assist first responders and the community. 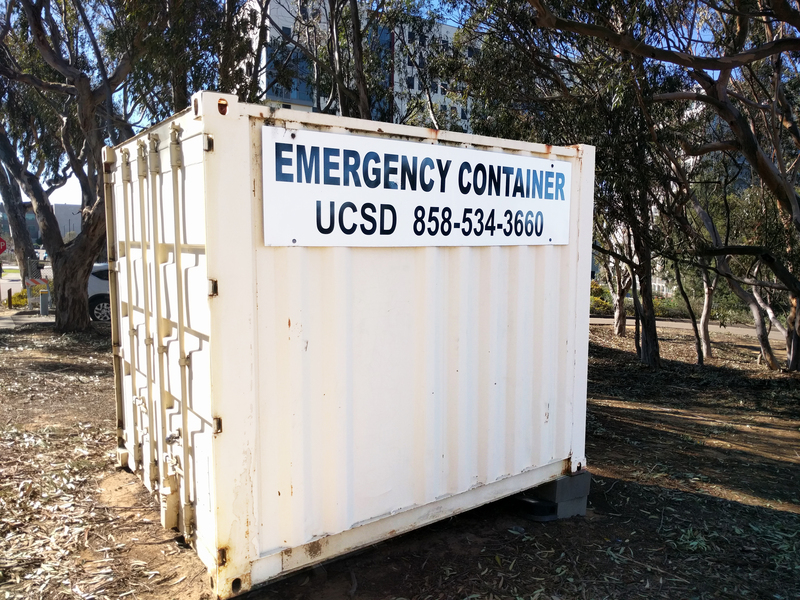 UC San Diego maintains 13 shipping containers with emergency food, shelter and medical supplies in various locations throughout the campus. Campus Emergency Response Team (CERT) volunteers open and activate the emergency containers, establishing outposts during emergencies or disasters. UC San Diego currently has one of the largest CERT programs in all the UC system and in San Diego County. Avoid obstructing containers (i.e., staging equipment near or on sides and doors). Contact the police department or EH&S if you notice a vandalized container or safety hazard. Emergency container use is restricted to trained CERT members. Questions? Contact the EH&S Emergency Team (858) 246-0695.